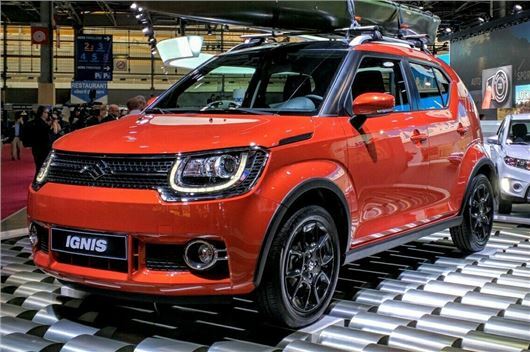 Suzuki has given the new Ignis its European debut at this year's Paris Motor Show. The small hybrid uses the same powertrain as the Baleno hybrid and will go on sale in the UK from the spring, with prices expected to start at around £10,000. Power will come from a 1.2-litre petrol engine producing 91PS, linked to the same hybrid system recently introduced in the Baleno. UK cars will be available with front or all-wheel drive, via either a five-speed manual or five-speed automatic gearbox. The Ignis features retro styling cues that hark back to cars from Suzuki’s past, including slats behind the rear doors and tail lights similar to those on the Suzuki Whizzkid launched in the late 1970s. Despite 4x4 styling the Ignis is compact in size, with a length of 3693mm – longer than a Celerio but shorter than a Swift. The minimalist dashboard features an instrument binnacle with a large speedo, plus there is a touchscreen system with smartphone connectivity. Rear legroom should be generous for such a small car, plus there is adjustment in the rear seats, allowing the owner to choose between legroom and load space. A good looking little car that could well add to Suzuki's current successes. The 1.4 boosterjet with 4 wheel drive could be fun! Looks like something from Russia, liked previous Ignis but not this abortion.